We’ve reached out to Motorola to confirm the date, but we’ve previously heard that the launch would be coming in September. The Moto X Pure/Style is the third generation of Motorola’s Moto X, meant to take on all the Android juggernauts out there, and starts at a crazy good price—$400. 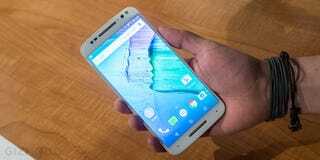 That includes a 5.7-inch QHD display, Motorola’s excellent software, and in-depth customization via Moto Maker. It will be available through Motorola and on every major U.S. carrier. You can read all about the new Moto X in our hands on below.